Wallis Fashion invited me to participate in their Summer Style Contest! For those of you who haven't heard of Wallis they are a UK aspirational, premium high street brand with the most adorable clothing. Wallis has finally branched out online to the United States and is now offering their complete selection of apparel, accessories, and shoes. I picked out a few items to style, one of which was this striped blazer. I chose this blazer because it's so versatile and I can mix and match it with almost all of my staple wardrobe pieces. I've been a big fan of simple white and black outfits lately and I think women of all different ages and sizes can pull of this look. I always feel a bit awkward asking for votes but if you could just take a minute of your time and give me your vote I would appreciate it! The contest began on Monday and I'm the loser with only one vote thus far so I'm really easy to find ;P You can vote for me HERE (once every hour until the competition is over). If you don't want to vote for me, no hard feelings! So cute! 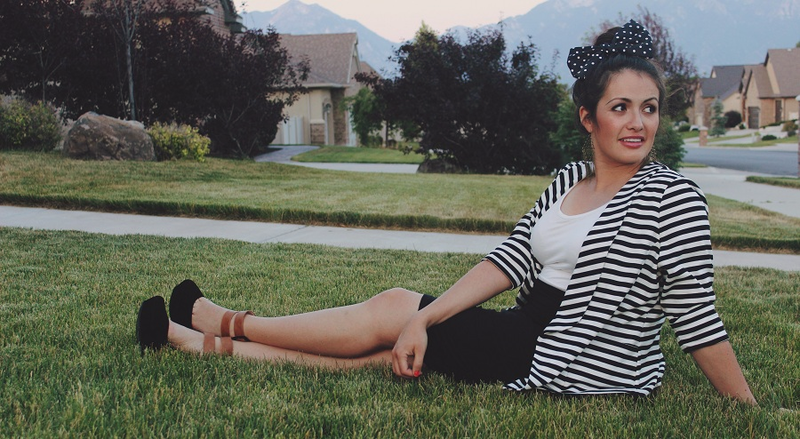 I love that striped blazer and the polka dot bow together! :) You look darling an I'm obsessed with your shoes! Totally voting for you! I love the pattern clash together - so cute! I love back and white together. I love that you didn't shy away from the big bow. It makes this outfit so you! Love the brown shoe with the black and white too. Nailed it, mama! Ahhh those shoes!! They are so gorgeous! You look fabulous! Great style. I found you through Wallis on FB. Amazing, the scenery on your photos looks exactly like here in Bavaria, Germany. Few things are better than stripes and polka dots! I love how you styled the blazer. Such a gorgeous blazer, I love that you let it stand out! You look gorgeous! molto carina la giacca e i capelli acconciati così (; Reb, xoxo. how cute! i love your hair like that. have a good weekend! cute outfit! love the bow in your hair!